Who: Any students in grades 6-8 who is a registered student of either St. Mark School or Religious Education at St. Mark Church. When: CYO Tennis runs from late August through late October/early November. Where: Practices take place at Vienna Woods in VA between 4:15 PM and 5:45 PM on Wednesdays starting on August 29 and ending on Oct 31. The practices on August 29 and September 5 will be skill assessments with a parent information meeting taking place on September 5. Matches will take place on Sunday afternoons locally from September 16 – November 4th (including Columbus Day weekend). 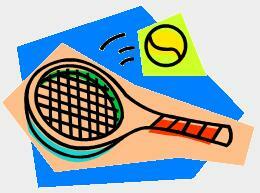 Coach: We have a tennis pro–Mary Ellen Giuseppe–who will coordinate overall. Parent volunteers are very helpful as assistant coaches! Tennis experience is helpful but certainly not necessary. Volunteers must be compliant with diocesan child protection norms. Registration: To sign-up, please complete the St. Mark CYO Tennis 2018 Permission and return with registration fee to Janine Bruhn (Schraml) or the Youth/RE Office at St. Mark. Participation will be limited to the first 20-25 registrants. For more information, contact Janine Bruhn (Schraml) at janinebruhn@verizon.net.